Wisnawati used to make three million rupiah (US$325) a month tapping rubber trees, but now, after years of rampant deforestation, she farms rice and coffee and is lucky to bring in half that each month. “We used to get everything we needed from the forest – wood for our homes, our daily meals. We can’t do that any more because there’s just not enough,” said Wisnawati, 35, who owns a small farm in Lubuk Birah, a village of about 350 people in Indonesia’s Muara Siau City, Jambi Province. For generations villagers have extracted and sold honey and nilam plant oil – used as cooking oil and to make cosmetics. But most have had to find a secondary source of income as resources run thin, the result of a 20-year selective logging concession held by an Indonesian timber company on 490 sqkm of Merangin District forest surrounding the village. Home to 10 percent of the world’s tropical rainforest, Indonesia is clearing its forests faster than any other country, losing 51 sqkm a day, according to Greenpeace. Indonesia is now the world’s third-biggest emitter of greenhouses gases, mostly thanks to deforestation and degradation, and Jambi has already lost two-thirds of its virgin forest. Farmers say animals forced out of their natural habitat by deforestation are wreaking havoc in the village. “There are thousands of pigs around now. They destroy our crops,” said Dahlan, a 52-year-old farmer. Last year, 13 people in Merangin were mauled to death by tigers whose habitats had been destroyed, said Arif Munandar, director of the Jambi office of Friends of the Earth Indonesia (Walhi). In addition to depleting resources for forest-dependent communities, deforestation is contributing to an increase in small-scale natural disasters. Reducing deforestation is crucial to preventing small-scale disasters, such as floods, landslides and droughts. The number of floods, landslides and droughts in Indonesia has risen significantly in the past decade, according to the National Disaster Management Agency (BNPB). “As the climate changes, we can expect more heavy rainfall, and that will only mean more floods and landslides if the forests continue to be cleared,” said Locatelli. Floods and landslides caused more than 3,500 deaths and the evacuation of four million people between 2000 and 2009. Last month in Oslo, Indonesian President Susilo Bamabang Yudhoyono declared a two-year halt on new concessions on Indonesian peat land and rainforest. In exchange, Norway will give Indonesia $1 billion, which it can claim as carbon offsets. But activists say this is not enough and existing commercial activities in forests should be moved to degraded land. 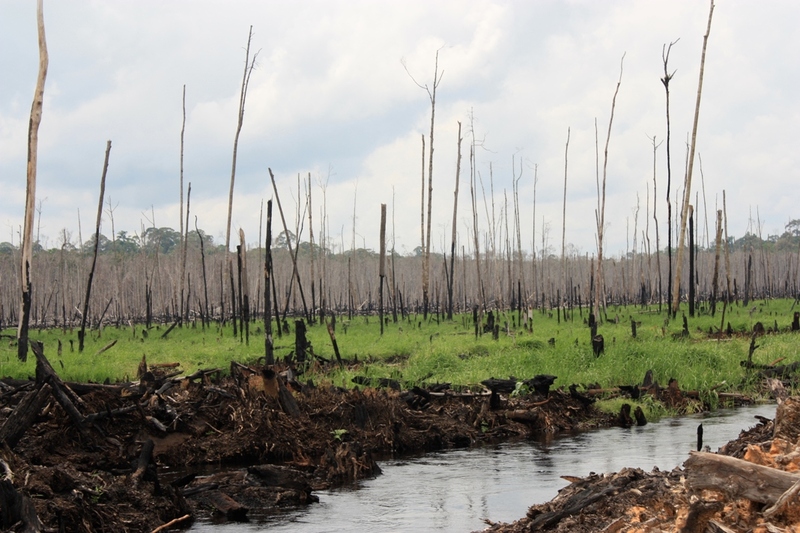 “There are so many existing concessions in Jambi that almost all the forest will be gone if those operations continue,” said Walhi’s Munandar. The suspension is part of the president’s pledge to cut carbon emissions by 41 percent by 2020. “As long as we can keep using our forest sustainably, we hope the government protects our forest from companies for ever, so our children and grandchildren can continue to live the way we have for generations,” said Wisnawati.